Cards will be sent to the Applicants Home Club for verification and will normally be availalbe for collection from that Club 7-10 working days from the date of application. 2. You must make a tee-booking at least 24 hours in advance of the intended date of your visit. 3. Conditions of card acceptance may vary at each participating Club. Play is entirely at the discretion of the Host Club who may, at busy times, decline to accept County Cards. 4. The Card is not intended for use as part of a Society booking. 5. The Card Holder agrees to abide by these Rules & Regulations & also those of the Club being visited. 6. A County Card is available to Members (male or female) of clubs that are affiliated to the Devon Golf provided they have a valid CDH number and CONGU handicap. 7. 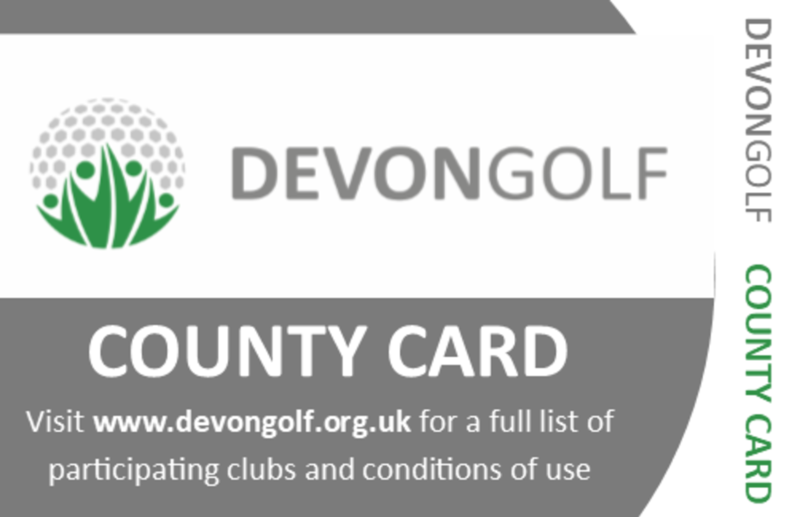 A County Card is only valid during the period of time of your membership to a DevonGolf affiliated club. If you chose not to renew your membership within the calendar year of an issued County card the card cannot be used to receive a green fee discount. 8. There is a £5 replacent card fee for lost or misplaced cards and errors on the original application.